This map depicts the lands belonging to the Delaware Indians that were put up for sale in 1856. Attached to the map are three supporting documents. The first is an excerpt from the U.S. treaty with the Delaware Indians, dated 1854, which explains that the Delaware lands, once surveyed, would be sold at public auction. Indian Territory became Kansas Territory after the passage of the Kansas-Nebraska Act in 1854, and white settlers flooded into the area. 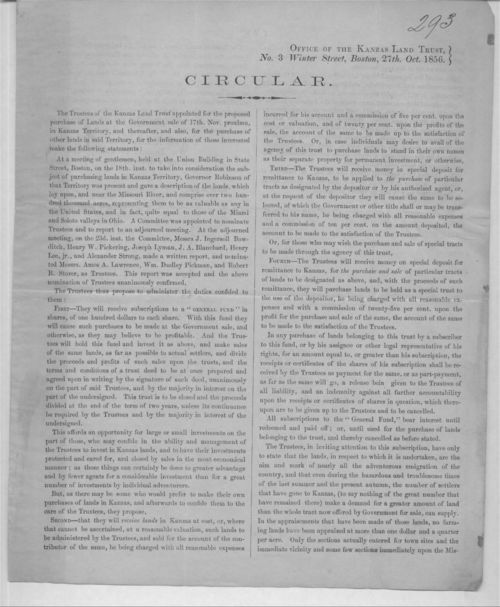 The next document is a proclamation by President Franklin Pierce that outlines the terms of sale, dated 1856. The third and final document describes the geography and resources of the Delaware land and gives more details regarding the price. This source demonstrates the continued advancement of white settlement; for instance it works in tandem with discussions of the Kansas-Nebraska Act. It also gives details about what Delaware lands looked like and where they were located, which is useful for a case study of the Delaware. Furthermore, it shows how native tribes were not assured a permanent existence in Kansas and continued to lose their land. This source could also be paired with the map of all the Indian lands in Kansas according to Isaac McCoy's surveys.